Galen Beckett is the pseudonym for writer Mark Anthony for his MAGICIANS AND MRS QUENT series. Anthony started his series to answer the hypothetical question, “What if there were a magical reason underlying the social constraints faced by a Jane Austen or Charlotte Bronte heroine?” Anthony lives in Colorado and has also published the LAST RUNE series. He also writes for the series DRAGONLANCE, RAVENLOFT, AND FORGOTTEN REALMS. Here is Anthony’s website for Galen Beckett. From the back flap: "What if there were a fantastical cause underlying the social constraints and limited choices confronting a heroine in a novel by Jane Austen or Charlotte Brontë? 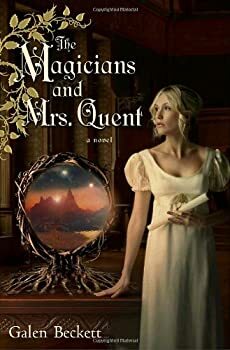 Galen Beckett, ... began The Magicians and Mrs. Quent to answer that question... "
I was excited to receive a copy of The Magicians and Mrs. Quent, Galen Beckett's “debut” novel. There's something exciting about a new author — they're fresh, and when you hold one of their books in your hands (especially a beautiful one like The Magicians and Mrs. Quent), you hope that maybe you're about to discover a brand new talent.